The perfect connection between guitar and iOS/Macs. A robust, portable plug-and play connection. Accurately translates your guitar tone and dynamics. Provides quality sound all the way. Plugging your guitar into an iPad, iPhone or computer requires an audio interface, but converting that precious guitar signal to digital depends on the quality of its A/D conversion. 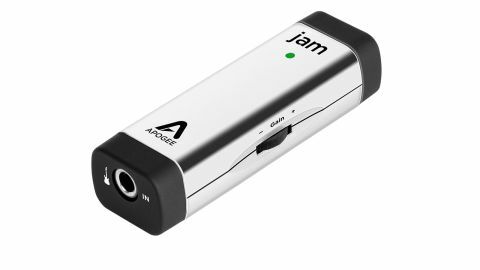 Apogee is the go-to name in that field for professional audio, and following 2011's JAM has introduced a new model - the JAM 96k. This takes things to a new level by offering up to 24bit/96kHz operation and a Class-A JFET input stage, designed to emulate the warmth and character of a valve amp circuit. At one end of JAM there's a guitar input and at the other there's a socket for the cable that connects to your device; JAM ships with three cables - Lightning, 30-pin and USB. Power is derived from your device or computer, a single multi-coloured LED lighting up blue to show you that everything is working. A knurled wheel on the side lets you set the gain for your guitar, with the LED glowing green, amber and red to guide the way. Plugging into an iPad and using JAM with Garageband, BIAS, AmpliTube and others, as well as into a Mac running Logic, we were treated to a natural- sounding signal with lots of dynamic range that brought the best out of the apps.